← Canadian Tire Makes Good on Repair Problem. Any­ways, anoth­er RPS arti­cle quotes Valve as say­ing that Por­tal 2 may be Valve’s last tru­ly sin­gle-play­er expe­ri­ence. I’ve done some think­ing on this and since Half Life 2 — Episode 3 is yet to come out and since it will be affect­ed by (and like­ly con­tain some con­tent from) the expe­ri­ence of cre­at­ing Por­tal 2, I’m com­ing out and say­ing that I think Episode 3 will be a Co-Op expe­ri­ence with play­ers con­trol­ling both Alyx Vance and Gor­don Free­man. 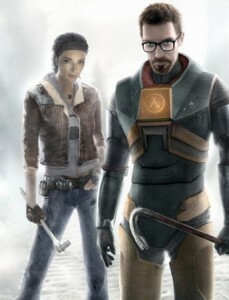 This entry was posted in Games and tagged alyx vance, co-op, episode 3, Gordon Freeman, half life, portal, steam, valve. Bookmark the permalink.